Der korrupte Bänker Sani Mustafa hat das schlafende Konto entdeckt und will es sich unter den Nagel reißen, leider braucht er aber dazu fremde Hilfe. Robinson Brown, Mitarbeiter im Institut für angewandte Kulinaristik, kann immer Geld gebrauchen und bietet Sani Hife an. brown robinson Aug 1 to sani.mustafa20. Ich wäre interessiert an dem Geld und bin bereit zu helfen, allerdings müssen Sie mir auf deutsch schreiben, da ich kaum englisch verstehe. Could you please call me immediately on phone? Here is my private phone number + 226 75128222. MR. SANI MUSTAFA. An accountant by profession, I'm presently working at the office of Bill and Exchange Department of Bank Of Africa (BOA). I am married with three children. My residences address No: 7 avenues Ave la 22 avenues de la Kanazoe Ouaga sect. : 21. Box Postal: 01 bp 5256 Ouagadougou Burkina Faso . My Private Telephone No is +226 75128222. Concerning what I need from you about this transaction. Although based on mutual trust and understanding. As you will lead me in establishment over in your country. Concerning the transaction at hand, as this cannot be done by email alone. Meanwhile, I would want to detail you a little on the fund to be transferred to your account. This is not stolen money rather, a discovered abandoned money belonging to one of our late customers by name DR. GEORGE BRUMLEY who died some years ago in a plane crash together with his family living behind his contract sum unclaimed in our Banking Custody. According to one of our banking policies which stipulate that after some years of unclaimed fund, the fund will automatically go into the treasury of our bank as an unclaimed dormant fund. That's why I want to use you as next of kin to the deceased customer and claim out the fund. Importantly and as I discovered, my bank does not know that DR. GEORGE BRUMLEY has no next of kin which makes it easier for you to stand in as next of kin to the deceased person. It's only me and my colleagues who knew that DR. GEORGE BRUMLEY has no next of kin. There is no risk about this for its 100% risk free as I will provide you with some vital documents related to the contract sum of DR. GEORGE BRUMLEY and a test of APPLICATION LETTER OF CLAIM which you will resend to bank fax line, introducing you as next of kin to DR. GEORGE BRUMLEY and also instructing the paying bank to effect the transfer of the inheritance fund of DR. GEORGE BRUMLEY into any bank account which you will provide and submit to the bank. I will also sending to you my Bank ID card, To prove my genuity and the trust I have on you, with your declaration of interest and willingness to cooperate with assurance that you will not sit on this money when it gets to your account and a promise not to implicate me in this business, I will furnish you with above information. Could you please call me on the above phone number immediately you receive this email, I will be waiting. Eagerly waiting for your urgent response. To the little i have seen in you, i am very happy to have you as my business partner for this transfer; and there is nothing that would stop us not to achieve this goal if only you are ready to ABIDE to my instruction and co-operate with me for the success of this transfer. Please i want you to keep this transaction very confidential, and let it be a top secret strictly known between you and me alone, because i am still working with this bank. If the bank authority here finds out that i was the person who gave you the information about this deceased bank customer, and the fund he deposited in the bank here; i will lose my job with the bank here without any compensation. You are only required to act on my behalf from there by following my advice, because i will be giving you information from time to time concerning bank decisions towards this transaction when you apply as the next of kin/beneficiary of this fund. I have planned to draft and send you an application letter to fill in your receiving bank account information and send directly to the bank email address OR fax-line for recognition as first step forward; but I think is necessary for me to know if you have a bank account that will receive this fund. 40% of this money will be for you as foreign partner, in respect to the provision of a foreign account, while 60% will be for me and I will meet you in your country immediately the fund is transferred to your bank account. Do you have an active account? Please email me and keep everything secret for security purpose of you and me. MIt dieser Aufteilung kann ich leben. Hattest du mir eige3ntlich schon gesagt wievile der gute alte George in eurer Bank deponiert hat ? Natürlich bleibt das alles streng geheim und vertraulich. Bei dir doch auch,oder? Wissen noch andere in deiner Bank davon ? Dann schick mir schnell die Zettel. I want to first thank you for the effort that you are putting to make this success together with me, and glory be to Almighty who has given us this opportunity to champion this victory. I contacted you to act as the next of kin to George Brumley to transfer this fund into your account. As i told you before in my first email, that this transaction is 100% risk free and I don’t want you to be afraid or to entertain any atom of fear over this transaction, As soon as you apply and receive any massage from the bank kindly forward it to me so that i will be directing you on what to do. I want to inform you that all the information that the bank may need concerning the owner of this fund is with me right now. So all i need from you now is to provide an account were this money will be transferred to. I am right sending to you the application form which I would like you to use to the bank, I will not forget to let you know my dear brother that i want you to trust me and also trust on what we are about to do, with this both of us will make success in this business, just try all your possible best to see that you follow my instruction and advice that i will be given to you, with this my dear we are going to achieve maximum success in this business. Please fill the form below and send it to the Bank E-mail Address for the claim of the funds. RUE 2. PLOT 167, AVE.
Wishing my application will be given an urgent attention, as I wish the balance be released, and re-transferred into my account details. Accept my apologies for the late application it was due to some logistic problems, which have been just settled. Thanking you for your anticipated co-operation. Wie gewünscht, schickt Brown die Bankverbindung an die Bank und Sani Mustafa. Das Konto existiert aber nicht. robinson.brown30 Aug 5 to b.o.a.finance, Sani, sani.mustafa20. It’s OK and well filled. I receive and have carefully gone through the filled application letter for the claim, you forwarded to me. I’ve carefully checked your filled application letter for the claim. Now, hurry up to contact the authority of the bank of Africa for recognition as I have advised you previously. Contact the authority of the bank of Africa to transfer the money to your bank account. The application letter for the claim is OK and well filled. Note well: Please be prepared to receive me at last because I will meet you in Germany or in your neighbouring country. According to our agreement for the normal sharing and disbursement of the Money between the both of us as soon as the authority of the Bank Of Africa transfers the fund to your account. Contact the bank of Africa immediately and inform me soon. noble bank before his sudden death. you to view the bank reference Questionnaire form attached. Copyright 2004 Group Bank of Africa . Online Inc., all rights reserved. Mit den Fragen bin ich überfordert, da brauch ich deine Hilfe. Thanks for the forwarded Official Questionnaire which you received from the bank here. I’ve been conducting researches since i read through the message in order to collect all the answers and forward them to you so that you can copy them and re-send to the bank here. I already told you earlier that I have files containing the deceased customer's biography and personal related information hidden in shelves in both my office and in my house because the deceased customer was my personal friend before his accidental death; hence i have all the personal information about him. As needed, i have carefully collected the answers to the asked questions from where i hid the files and information about the deceased customer. I have also written the answers below and have sent them to you. Dear, since the bank has started responding positively to your application with an official questionnaire, we should pray harder and hope in the Almighty God for the most favourable response from the bank authority soonest. Again, before giving you the answers below, I want to advise you on one very important thing which you must be very very careful about as the bank has started responding positively to your application. Please listen and listen very carefully now, normally, the bank authority here conducts series of investigations, underground researches and inquiries to find out if anybody applying as a beneficiary or next of kin to any deceased customer of the bank here is genuine or fake. In doing this, the bank authority uses various strategies, they may send you business proposal letters similar to the first one i sent you but using different amount of money, and at times using different names of deceased customers or different bank addresses. So, you should be very careful of such tricks and pranks which the bank usually employs to discover the reality of any claim. 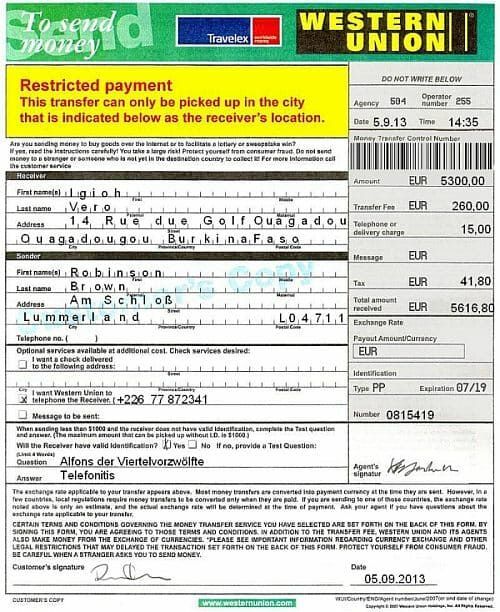 Therefore, from now onwards, any mail or letter you may receive relating to any international money transfer of any kind, including lottery winning, from any person or from any bank or even from any part of the world, no matter which country, please do not reply it, rather try to forward me such mails when you receive them so that i can verify the source. In summary, there is no problem of any kind and you should not be afraid of any such proposals or mails because i know all these secrets and therefore, I leak them to you before hand. If there is any other information the bank may still want from you either through mail or phone or otherwise which you cannot provide; do not delays to contact me either by mail or through my direct phone number: +226 7512 8222. Thanks and special regards. 7. If yes, what was the name of the firm and its registration number?........Elite Construction INC.
Avenue Yanenga, Ouagadougou - Burkina Faso. 13. State clearly his residential address here in Burkina Faso ......Villa 4, Rue 7, Avenue Yanenga, Ouagadougou - Burkina Faso. This is to bring to your notice that this bank has approved your inheritance fund of Ten million united state dollars for transfer into your nominated bank account. (1) Certificate of legality (2) Affidavit of claim (3) Certificate of incorporation (4) Death registration certificate. That will back you as the real next of kin to our deceased customer and also back your fund so that your home government and your bank will not put eyebrow on your inheritance fund. So you are hereby required to see the attachment file for more details information’s. You are here by given on or before the date August 2013 to submit to this bank the required legal certificates. Failure to comply, your application form will be cancelled and your inheritance fund will be transferred into the bank treasury as unclaimed dormant fund. Once more congratulation! And accept our condolence greeting of your late business partner (Late Dr. George Brumley) who is a very good customer of this bank when he was alive. Ich kann leider nicht persönlich nach Afrika reisen, da ich nicht die notwendigen Impfungen habe und auch kein Einreisevisum besitze. Wie komme ich nun an die geforderten Papiere? Sani will auch, daß Robinson nach Afrika reist. Am urgently waiting for you. I've just gone through your massage, and really; i am very much happy for the approval information from the Bank. There is nothing that can stop us from achieving that money hence the bank has approved the money with your names for transfer. Meanwhile I have just understood that the bank of Africa needs you to come down here for the final processing/release of the fund to your Bank account. So kindly try to come down here to meet the Bank officials. Please for trust you should arrange to come and i will direct you on how you can meet with the bank Directors but you should know that I wouldn’t come out with you in the bank, so that the bank officials will not understand that I am the person that have been giving you all this information that has been required so far for the transfer. I don’t have those certificate and i cannot take the risk in producing them otherwise the bank will understand that i am with you. When you will come down here; the bank director may appoint for you a Lawyer here who will lead you to the high court of justice and get those 4legal certificates for the release of the $10million united state dollars to your bank account within 72hours. I am very much happy that every thing is going well and my family will be very happy when you will come here for the final requirement in the Bank here. So please try to call me so that i can known the exact date and time when you are coming here in BURKINA FASO for the process of the claim funds, please i don’t want to put you in a tight condition with my suggestions; so if you can’t really make it, i will say you should go for the second alternative and I will advice on phone or email for the progress of the transfer. If you can’t make it, I will advice you to go for the second alternative; I believe you will like it OR you try your best to come as this is the final requirement for the fund release to your bank account. I am urgently waiting for your Call +226 7512 8222. Ich habe nochmalmit dem Arzt gesprochen, Er hat erst nächste Woche alle notwendigen Impstoffe und dann muß ich noch 4 Wochen warten wegen negativer Impfreaktionen. Sie sehen also so schnell geht es nicht. Gibt es dort keinen Anwalt der das notwendige Procedere erledigen kann für mich. Please contact the Bank for assistance. I have received your message and i understood that you will not be able to come here, as quickly as possible, but i want you to understand that i cannot organize those 4legal certificates by myself. Otherwise, the Bank Authorities will understand about my involvement with you. I never want anybody in the Bank to understand that I'm involved with you in this transaction and that is why i cannot organize those certificates by myself to avoid suspicious from the Bank authorities. But i have trust in God and i believe that we can achieve the success of this transaction. Listen now! You should contact the Bank and request them to help you by appointing a capable lawyer who will help you procure the 4legal certificates from the concerned government ministries here and sign for the fund release to your bank account without your visit to their office. I mean that you should contact the Bank now and you should negotiate with the Bank for a possible lawyer assistant without your personal visitation to their office. Please you should ask the Bank to give you a lawyer who can procure and sign the transferring documents on your behalf, because I don't want to find the lawyer by myself to avoid problems at the end. I don't want to find the lawyer by myself to avoid problems, because the Lawyer could inform the Bank about my involvement with you, or the Bank authorities may trace the involvement of the lawyer whom I may find, I don’t want to contact any lawyer for this purpose otherwise the Bank authorities must trace about my involvement with you, so you should pretend and tell the Bank that you have no friend here who can help you to look for a lawyer. So, you should kindly contact the Bank now and you should request the Bank to help you to find a good lawyer on your behalf who can sign for the transferring of the funds into your Bank Account. Please hurry up and get back to me as soon as you have contacted the Bank. Moreover, I think the Bank will believe in you when you will tell them that you do not have a representative here. OK, I am sending to you the message which i would like you to send to the Bank about the lawyer. OK now, find the message which I have composed for you, now you should send the message to the Bank Address. I AM ..............................., I’m writing for the concerns of my inherited funds which has been approved by your Bank of Africa, i have gone through the approval receipt from your Bank and i can understood that my presence is highly needed at your Bank premises. But I would like to make it known to the Authorities of Bank of Africa that my business occupancy will not permit me to come to Burkina Faso, so, I will kindly request the authorities of the Bank of Africa to help me to appoint a capable lawyer who will procure the 4legal certificate and sign for my funds transferring on my behalf, due to my inability to come To Burkina Faso. I would want to plead to the Authorities of Bank of Africa that I will not be able to visit Burkina Faso; due to the occupancy in my business. Please sirs, I am humbly requesting for the assistance; from your Bank to help me by appointing for me an attorney who will procure the 4legal certificate and sign for the transferring of my funds since I’m unable to visit your Bank due to my business stages. I will appreciate mostly if your Bank will consider my plea and give me an attorney who will work for my funds to be release into my Bank Account. brown robinson Aug 23 to b.o.a.finance, bcc: Sani, bcc: sani.mustafa20. 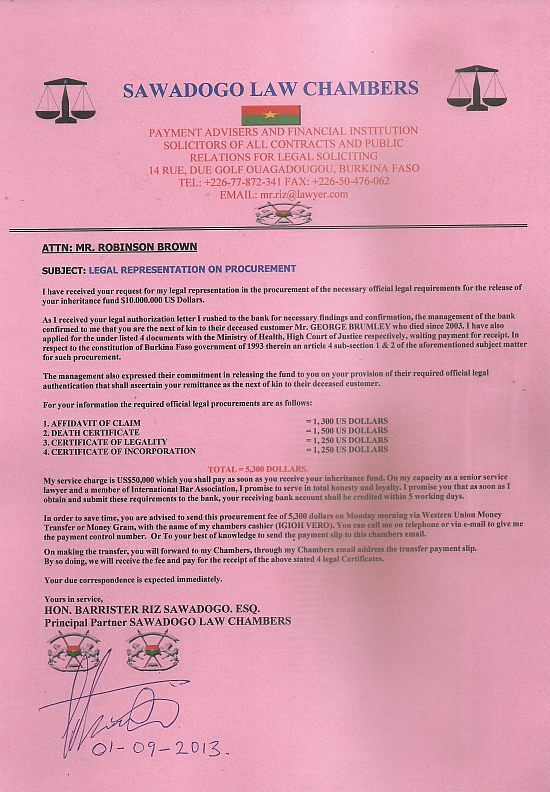 I AM Robinson Brown., I’m writing for the concerns of my inherited funds which has been approved by your Bank of Africa, i have gone through the approval receipt from your Bank and i can understood that my presence is highly needed at your Bank premises. This Is To Bring To Your Notice That The Management Of The Bank Of Africa Has Confirmed Your Letter Sent To This Bank Requesting For A Solicitor, With That Terms; Being That You Are A Bonafide Beneficiary Whom Is Not A Nationality Of This Country, It Is Our Duty To Proper Guide You Through An International Based Firm/Attorney Whom Will Attend Your Funds Clearance As You Have Required. At This Juncture, You Are Advice To Contact The Advocate For Attendance Of Your Funds Clearance In This Financial Institute. Address: Sawadogo Law Chambers, Ouagadougou, Burkina Faso. Finally, Be Notified That Our Apex Sundry Unit Has Registered Your Inheritance Funds For Transferring Through Chips Electronic Code Transferring Which Shall Pass Through Our 'Corresponding Citi Financial Bank - Canada' For Crediting Of Your Approved Payment Into A Registered Bank Account. Robinson leitet die Request Granted mail an den Anwalt weiter. Sani darf mitlesen. Was muß ich tun um als Verwandter an das Vermögen von Dr. Brumley zu kommen? Schön,daß Sani die Arbeit mit dem lästigen Schriftverkehr macht. Please contact the lawyer to perform the task immediately. I have just confirmed your forwarded message from the Bank and I’m happy. Now, I’m sending to you the message below, which i would like you to send to the lawyer to work for us. But please, you should not disclose my involvement with you to the lawyer. I mean that you should not allow the lawyer to understand about my relationship with you otherwise he may inform the Bank managements about my involvement with you. NOW I’M SENDING TO YOU THE MESSAGE BELOW AND I WANT YOU TO SEND IT TO THE LAWYER AND CALL HIM SO THAT HE CAN WORK FOR US URGENTLY. I am sending you the below message for the Lawyer. Please always call me for an update. I am Mr............................................... I am being recommended to you by the Bank of Africa. 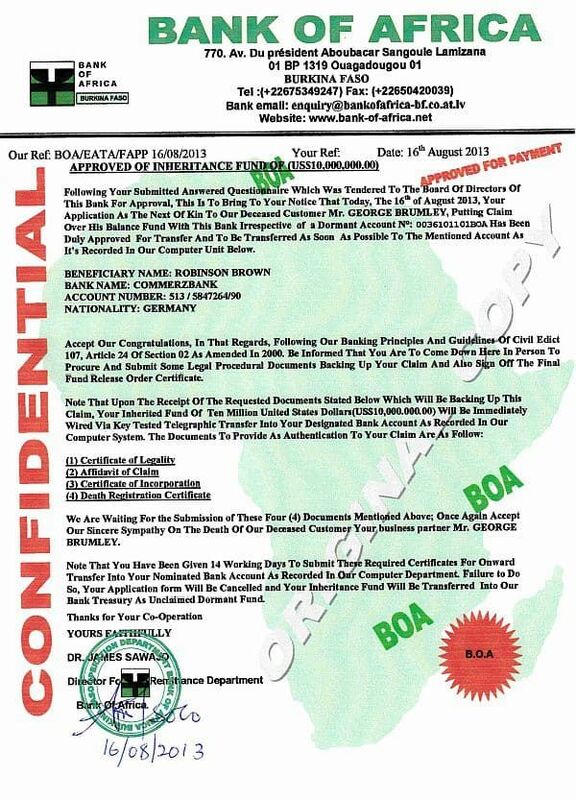 I am a business man from Germany, and I have an inherited sum of funds in the Bank of Africa which was belonging to my Late business partner and I have put claim over the funds in the Bank, and I have instructed the Bank of Africa to release my funds to my Bank account in my country but at this moment, the Bank of Africa has approved the funds and they are looking up to my visit, unfortunately now, I was unable to visit the Bank of Africa due to my work, and I have asked the Bank of Africa to assist me with an attorney service and from there, they have given to me your contact details. Please sir. I will appreciate your kind support at this moment and I will now demand for your service, because I need the Bank of Africa to release my funds to my Bank account. So, kindly visit the Bank of Africa to sign for my funds transfer. Here is my Telephone Number for your reference……………………………….. I am Mr.Robinson Brown I am being recommended to you by the Bank of Africa. This Is To Notify You That This Honourable Chambers Is In Receipt Of Your Mail Which You Are Seeking For Our Service As You Have Been Directed By The Bank Of Africa To Contact Us. This Honourable Chambers Hereby Welcome You To This International Law Firm As We Have Our Correspondence All Over The World. Note: We Have This morning; Quickly Commenced Formal Preliminary Enquiries And Cross-Examinations Over Your Case With The Incumbent Foreign Remittance Director Of The Mentioned Bank Immediately We Received Your Message Sent To This Legal Firm Today, Being Saturday, 31st Day Of august 2013. All Things Being Equal, We are Proceeding to Visit the Federal High Court of Justice and the Federal Ministry Of Health/Population, Here in Ouagadougou, Burkina Faso, To Confirm the Cost of Those Certificates. You Are To Send The Following Information Of Yours Below For Registration. 1) Your House Address or Office Address. Robinson schickt seine Daten.Den Berufswechsel wird Sani und der Barrister nicht merken. Sequel To The Initial Response Sent To You From This Legal Firm Yesterday 31st of August 2013; We Wish To Use This Medium To Inform You That The Bank Governor Have Confirm To Us That You Are The Real Beneficiary Of This Fund. The management also expressed their commitment in releasing Your Approved Inheritance Sum of Ten Million U.S Dollars to your Germany account upon receipt of the required certificates that shall ascertain your remittance as the next of kin to their deceased customer. Meanwhile We Have Gone To The concerned office For the Necessary Findings on How We Can Procure Those required Certificates. Note: You Should Find the Attached File for Details on How We Can Get Those required Certificates. Be Informed That As Soon As This Chamber Receives the Procurement Charges of 5300 Dollars; We Will Quickly Go To The Ministry Of Health And High Court Of Justice To Get Those 4Legal Certificates Required. We are waiting For Your Prompt Action towards Your Services. Leider gibt es hier in Lummerland wegen der Bürokratie ein kleines Problem. Zahlungen über Western Union oder Money Gram dürfen nur noch durchgeführt werden, wenn bei der Einzahlung eine scan Kopie des oder der Empfänger vorgelegt werden kann. Ich brauche nach Auskunft der Western Filiale in der Parkbank einen scan des Passes von Herrn Igioh Vero und auch von Ihnen, da Herr Vero bei Ihnen beschäftigt ist. Bitte senden Sie es so schnell wie möglich, damit es keine Verzögerungen gibt. Sequel to your email sent to this legal firm today 3rd September 2013; you should be notified that Igioh Vero is my chambers cashier, and you should find his passport attached. Hon. Riz Sawadogo wird sich freuen, Robinson will zu Western Union gehen. Ich habe heute nachmittag frei und werde dann die Einzahlung tätigen. Ich war gestern bei Western Union. Der nette Schalterbeamte hat mir geholfen das Formular auszufüllen mit seinem Coputer und mich gefragt, ob es wegen der hohen Summe sicher geschickt werden soll.Ich war damit einverstanden. Er hat mir dann folgendes ausgedruckt und ich soll es Ihnen mitteilen. kann Herr Vero es abholen. Be informed that we have this afternoon contacted your legal representative Hon. Barrister Riz Sawadogo, who indicated to us that the payment receipt you sent to him, dated on 6th day of September 2013, was fake and that he could not withdraw money with the payment receipt, so you are advised to be fast in contacting your legal representative Hon. Barrister Riz Sawadogo as your inheritance fund of $10.000.000 U.S Dollars will be immediately wired to your nominated bank account immediately your legal representative submits the required certificate That will back you as the real next of kin to our deceased customer and also back your fund so that your home government and your bank will not put eyebrow on your inheritance fund. This is just a short note to inform you that we have received your payment receipt sent to this legal firm email address, but unfortunately; your payment could not be picked, because the control number and information’s in it, is not correct. We are very sorry to inform you that we can only proceed in your service, once we receive original payment from you, so please do not contact this chamber anymore, if you know you that you are joking with us, as we a lot of things and other cases to attend to. There was an access on the WU Igioh Vero file from Burkina Faso on 2013.09.06 15:02:43. We denied access because of two reasons. b: the person did not register. Only with a valid registration a download is possible with correct file and ownername. Ich hoffe Sie können mit dieser Auskunft etwas anfangen. "Es ist nichts so fein gesponnen es kommt doch alles an die Sonnen"
Da sich Igioh Vero richtig abmüht endlich an die MTCN zu kommen, fragt Robinson nach wie weit er gediehen ist. Dummerweise gibt Igioh Vero immer den falschen owner ein. Hat Ihnen die von mir weitergeleitete mail des supports helfen können? Hat Her Igioh Vero den Einzahlungsschein abholen können? Ich habe meinen Teil der Abmachung erfüllt, nun warte ich auf Ihre Zuarbeit. Robinson tritt Sani auf die Füße, weil sich weder Bank noch Barrister melden. Was sind das für Pfeifen bei der Bank und bei dem Barrister? Ich habe bezahlt, 5300 und bekomme keine Antwort mehr. Ist der Barrister ein Betrüger und mit meinem Geld abgehauen? Also da hast du mich ja in einen schlönen Schlamassel reingerissen.Ich kann mich ja an dir schadlos halten, denn du hast die Sache angefangen. Sieh zu, daß die restlichen Papiere und mein Geld zu mir kommt. Die Viererbande um Sani ist beleidigt. Sie haben es nicht geschafft, den richtigen file und ownernamen auf dem server einzugeben. Jeder Kontaktversuch von Robinson wird ignoriert. Ich bin entäuscht, Warum meldet sich keiner mehr bei mir. Ich will sofort mein Geld zurück! 0022675128222 war bei google noch unbekannt.